Creating a great bot design starts with great documentation. This free bot design UX template for Sketch can help you organize your thinking and align your project’s stakeholders. The template includes a bot design concept, along with a library of symbols — saving you time and giving your project a head start. This bot design template from ArcTouch is offered under the Creative Commons Attribution 4.0 International (CC BY 4.0) license. Please read and agree before you download. 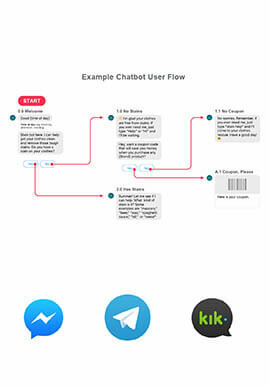 See our concept bot conversation flow built in Sketch and tailor it to meet your specific needs. Take advantage of design elements specific to Facebook Messenger, Telegram and Kik. Use scalable bitmap and vector symbols to connect elements in your bot conversation flow.